For the past few months, there has been a huge debate over the issue of wolf hunting. While not a new issue, the argument was recently reignited when Spitfire, a notably popular wolf among wildlife watchers and the daughter of another famous wolf 832F, was shot and killed by a hunter outside of Yellowstone National Park. Pro-hunting groups are quick to support the hunter, while environmental groups are quick to vilify the hunting of wolves. But is there more to this argument? Some of the largest proponents for wolf protection have called out the need for a buffer zone around protected areas like Yellowstone, while pro-hunting organizations are primarily focused on protecting the rights and liberties of the American hunter. Today I want to dive a bit into the history of this issue, highlight the major arguments from both sides of the debate, and offer some insight based on my own personal opinion and experience. So let’s dive into it. For this article, I am going to primarily focus on wolves and wolf hunting around Yellowstone National Park. Although wolves used to be widespread throughout the United States, their current range is primarily focused around Yellowstone, Michigan and Wisconsin, Alaska and reintroduced populations of Mexican Grey Wolves in New Mexico and Arizona. As of April 2017, there are around 5,700 wolves in the continental United States and around 7,700-11,200 wolves in Alaska. Yellowstone National Park is the site of perhaps the most famous case of wolf re-introduction. From 1872-1926, Wolves were hunted to extinction. For 70 years, the park’s ecosystem operated without a pivotal keystone species. A direct cause of this eradication was the drastic increase of Elk populations. While the hunters, elk watchers, and, of course, the Elk were happy with this change, the ecosystem simply was not. The large population of Elk caused a massive decline in new plant growth as the Elk ate young saplings and shrubs at an enormous rate. As a result, the whole ecosystem began to decline. While I could list every negative effect that occurred, this fantastic video, narrated by George Monbiot, really highlights the effects of the removal, and the reintroduction, of the wolf populations in Yellowstone. Following the Endangered Species Act passing in 1973, all wolf subspecies were listed on the federal list for endangered species by 1978, which required efforts to facilitate their recovery. In 1995, 8 Wolves were reintroduced to Yellowstone from Canada. Their effect on the local ecosystem was profound and led to several very charismatic wolves becoming icons of the role of predators in an ecosystem. Through 2008-2012, Wolves were delisted in the states surrounding Yellowstone, allowing state agencies to regulate the species as they see fit. This includes regulating hunting. In late November 2018, Wolf number 926F was shot and killed by a hunter in Montana; just outside the border of Yellowstone. This individual, affectionately known as Spitfire by wolf watchers, was a frequent sighting along touristed roads in the Lamar Valley. According to Montana hunting regulations, the hunter was within his legal rights to shoot Spitfire. The controversy surrounding this act is complex, to say the least. Aside from the fact that Spitfire was an enigmatic wolf shot and killed just outside the park’s border, she was also a daughter of another legendary wolf: ’06. In 2009, Wolf ’06 (832F to researchers) became a favorite amongst wolf watchers as she was a solo wolf with a ton of character. After wandering into the park, reports show that she was able to regularly take down elk 5-6 times her size by herself, had bred with a large number of males in the park and was spotted often by tourists in the park. In 2012, the same year wolf hunting around Yellowstone was allowed, ’06 roamed outside of Yellowstone and was shot (legally) by a hunter. So not only was Spitfire an extremely well-known wolf, she succumbed to the exact same fate as her mother. While the controversy surrounding wolf hunting has been reignited several times, these two incidents prompted a massive response through social media and news outlets, and have caused arguments surrounding every involved member. Why is there no Buffer Zone? A common question asked by proponents for wolf protection is “Why is there no buffer zone around Yellowstone?”. The argument accounts for the fact that wolves, and other animals for that matter, don’t recognize park boundaries as safe havens. Additionally, wolves maintain territories ranging from 50-1,000 square miles and they can roam up to 30 miles in a single day. For reference, Yellowstone constitutes an area of nearly 3,500 square miles and, as of 2016, contains 11 wolf packs totaling 108 wolves. 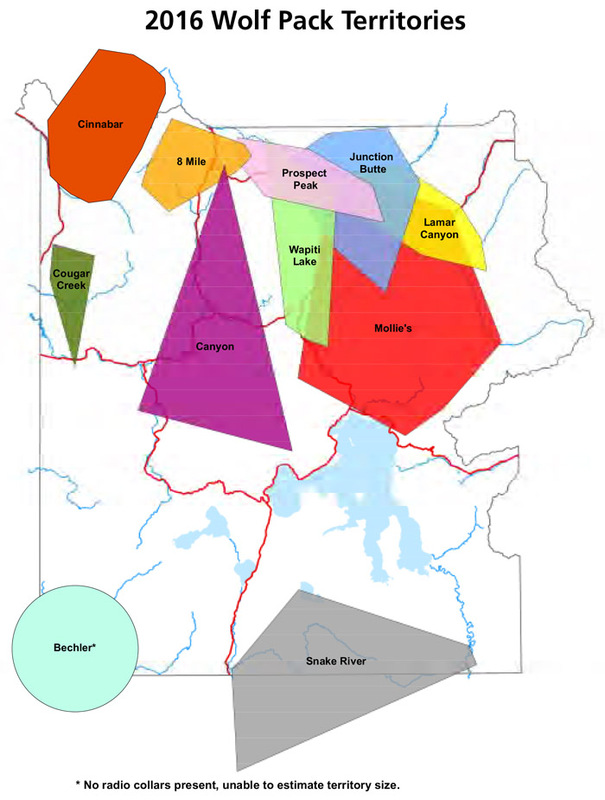 Pictured below is a map showing Yellowstone and all the wolf packs currently radio-tagged in the park. Yellowstone Wolf Packs. Red lines denote roads, while the dark black lines show the park boundaries. Montana is to the North, Wyoming to the East and South, and Idaho to the West. Notice how the vast majority of the ranges are either near the boundaries or even crossing them. What is important to note here is that Montana (to the north) is not only where the majority of the wolf packs reside, but also where both of these famous wolves (Spitfire and her mother ’06) were shot and killed. Currently, there is no buffer zone around the park for the state of Montana. But why is that? Even if wolves aren’t protected at the federal level by the Endangered Species Act, don’t you think the State Fish and Wildlife Service would want to try and protect the wolves? Well, they’ve tried to. In late 2012, 7 wolves were shot and killed by legal hunting over the span of several weeks. 5 of those wolves were actually research wolves and had radio collars attached to them to track their movements. Once the Montana Wildlife Commision (the governmental organization who manages the protection, hunting and any other regulations regarding wolves) heard of this news, they immediately suspended the hunting season while they tried to sort through the situation. However, this led to retaliation from the Montana legislature. The reopened the hunting season immediately and in early 2013, the Montana House passed amendments to House Bill 73 that restricted the rights of Montana Wildlife Commission to regulate wolf hunting. Montana House Bill 73 Chapter 13 amended sections 87-1-304, 87-2-104, 87-2-523, 87-2-524, 87-6-401, and 87-6-414. In essence, the commision cannot close the wolf hunting season unless a quota has been reached or institute a buffer zone, hunters no longer have to wear bright orange vests to hunt wolves outside of deer and elk season, and they decreased the fee for a wolf license from $350 down to $50. Some of the pros from these changes include banning the use of electronic call devices to attract wolves and instituting a 24 hour waiting period from the purchase of a license to its legal use. These changes are incredibly egregious and severely limit the power of the wildlife commision to do their job: protecting the wolves. Under the current statutes, the Montana Wildlife Commision cannot create a buffer zone around Yellowstone even if they wanted to. Why don’t we ban hunting of wolves? What is a true hunter? From here on, I will be purely discussing the facts surrounding trophy hunting, if it helps or hinders conservation efforts, and how it specifically relates to wolf conservation. Does hunting help or hinder Grey Wolf conservation? There’s a really fantastic article from National Geographic that presents a ton of arguments from all sides of trophy hunting in Africa. One of the main arguments supporting trophy hunting is that it provides a large amount of money towards conservation efforts. Currently, up to 60% of state wildlife funds come from hunting and taxation of supplies, licensing, and access to hunting areas. Although wildlife viewing and related activities (hiking, birding, horseback riding) have been on the rise over the past few decades and provide a fair chunk of money towards conservation, these activities alone do not provide a large enough revenue stream to protect these areas. In 2016, the US Fish and Wildlife Service received $75.9 Billion from wildlife viewers and $81 Billion from hunters and anglers. No matter what way you look at it, that is a substantial sum of money. And the relationship between hunter, government, and nature works for the benefit of all three. The hunter trusts the organization managing the lands on which they hunt. The organization makes every effort to manage the land for the greatest benefit to both those who use that land (hikers, hunters, birders, campers etc. ), and for all aspects of the environment. An ethical hunter who hunts in a manner that follows the rules and regulations does so with the trust that their actions directly help conserve the land and animals that they so dearly respect. If that trust is broken in any way, such as the government managing the land through personal ideology or politics as opposed to science and sound management practices, then the organization is failing its primary duty. Conversely, if the hunter is not following the set quotas, limits and seasons put in place by the management organization, then they are actively harming the ecosystem in which they are hunting. So how does this relationship factor into wolf hunting around Yellowstone? As we mentioned earlier, the wildlife commision in Montana is blocked from completely managing wolf hunting around Yellowstone. Without the ability to create buffer zones, the power to regulate the hunting season actively, and the support of the state government, how could they possibly manage hunting in any sustainable fashion? While yes, they set the quotas each year, there is no possible way to actively manage those quotas effectively while the hunting season is in full swing. They have no power to regulate where citizens can hunt wolves outside of Yellowstone. They have no legal recourse to stop or delay a hunting season once it has begun. Ultimately, they have no ability to manage the wolf populations in the very environment that they serve. Then the hunters shouldn’t hunt directly outside Yellowstone, right? Well, that goes back to the relationship between hunter and wildlife management organizations. It is entirely unreasonable to expect every hunter to be a complete expert on the ecology, population levels, and the individual identities of the wolves they decide to hunt. Hunters who shoot wolves illegally (within park boundaries, out of season, etc.) are always prosecuted to the full extent of the law and many of the hunters who hunt legally truly believe that their actions are helping conservation efforts. One final thing I would like to touch on is the hunters and portion of the public who are vehemently anti-wolf. The common argument is that wolves are leading to the extinction of elk populations and that they are eating livestock. Firstly, the elk population is much lower than it was 40 years ago. However, just like we mentioned at the top of this article, that is because of the absence of wolves in the first place. The large population of elk was destroying the local environment and needed to be curtailed through natural means. Currently, the elk population is on a decline, but that is because they are returning to sustainable levels in a healthier ecosystem as well dealing with a large drought. Secondly, some livestock has been eaten by wolves. That is absolutely true and an unavoidable consequence of predators in proximity with ranchers. That being said, loss of livestock from predators constituted only a quarter of a percent of the total livestock loss in the US. The vast majority of loss occurs from illnesses and weather; not predators. What has happened around this entire wolf hunting around Yellowstone debate is a complete breakdown of trust and relationship between hunter, nature, and the government. In Montana, the legislators have reduced the powers of the organization who protects the wolves. The organization cannot protect the wolves to the best of their ability and such there is an insane amount of tags being sold for wolves every year. The hunters’ individual actions are legal and many believe their actions help conservation efforts. This chain is fundamentally broken and needs massive change if we are at all going to help save the wolves in the American West. Yellowstone needs a buffer zone to help preserve these wolf populations, especially one in Montana. Hunters need to not be vilified by conservation organizations when they are in fact one of the major funders of conservation. Wolves need to be awarded protection based on sound science and management, not politics, fear, and misunderstanding. More cohesiveness between non-hunters and hunters needs to take place. Hunters are not all mindless killing machines and non-hunters are not all preservation oriented hippies. So if you don’t know, I am a wildlife biologist who is heavily into herpetology research. My projects have taken me to some pretty fantastic locations and allowed me to conduct some amazing research. That being said, one of my favorite projects had me heavily using Citizen Science as part of my research process. Citizen Science is a catchall term that describes where anyone can contribute to the research process in a meaningful way. This typically includes some form of data collection but also can be data analysis, processing, or any other number of techniques. From biodiversity snapshots to amateur astronomy, citizen science actually has been around for a very long time. Astronomy, meteorology, and even oceanography all have roots with citizen science! These are incredibly complex systems, that we even struggle to understand with advanced technology. So how did people hundreds and hundreds of years ago make amazing maps like this one? The map above was created in 1685 before satellites and advanced technology. They relied on mariners and explorers taking simple measurements repeatedly. Its an amazing, early example of the power of citizen science! And we still use citizen science today! Have you ever seen the weather report on the news? Yep, citizen science. Most rain gauges and weather nodes are collected by private citizens, schools, or non-profits interested in the scientific process. Even advanced topics have been gamified and turned into citizen science. Take the complex task of protein folding. Computers can run through every iteration of a possible protein fold, but they lack the ingenuity and abstract thoughts of humans. Enter FoldIt. An amazing example of taking an incredibly intricate problem, and letting regular people help solve it! But what does this have to do with conservation and biodiversity? There are a slew of biology-based citizen science projects out there. From BioBlitzes, Butterfly counts and classifying bat calls. There is a citizen science project for everyone. Mashable has an awesome post with 9 websites dedicated to wildlife-related citizen science. Check it out here! Now I want to focus on the style of Citizen Science that I use most heavily: Mobile Citizen Science Apps. What if I told you that there was a way to collect biodiversity data just by taking a picture with your phone? Well, you can and its fun! eBird is one of the better-known mobile apps for wildlife citizen science that catalogs birds as amateur and professional ornithologists find them. Created by the Cornell Lab of Ornithology, this app has been used to create real-world data and change! Check out this heat map of the Tree Swallow as it migrates through the U.S. This awesome media piece was created using only Citizen Science data! While eBird is an amazing tool and I know many people who use it, the main tool I use is called iNaturalist. "Every observation can contribute to biodiversity science, from the rarest butterfly to the most common backyard weed. We share your findings with scientific data repositories like the Global Biodiversity Information Facility to help scientists find and use your data. All you have to do is observe." So why would you, a concerned citizen, want to be a part of this? iNaturalist is really easy to use and for me, it’s like a game. I follow other people relevant to me, and we all share each other’s collections. I’ve always loved seeing my buddies travel and seeing what they’ve found. There’s also participation in BioBlitzes, intensive survey events, long-term monitoring projects, statewide conservation initiatives, and any number of contests aimed directly at capturing biodiversity. In fact, here is my iNaturalist page. I’ve only really been using it for about 2 years now, but in that time I have already collected over 100 species and nearly 250 observations of different animals. Now, I’ve given you a bit about why I love using iNaturalist for myself, but how can you get started with any of the apps? At the bottom of the page, i’ve linked 6 mobile apps that all collect citizen science data. While you don’t absolutely need one of the apps to start (you can upload pictures through their websites as well), the app is by far the easiest way to get started. All it takes is a quick picture and you have an observation. This should be the most straightforward step, but go out and find a park, a nature preserve, or even your backyard. These are great places to get started! I’ve seen lots and lots of wildlife. But if you look at my iNaturalist page you’ll see that it’s primarily reptiles and amphibians. That’s because that is what I am most interested in. It’s what I go out looking for, and so, its what I most often find. 4. Meet other citizen scientists! Today I decided to start a new series for the blog, “Field Test”. Now, if you don’t know me, I am a Field-Based Conservation Biologist. I have researched in Jungles of Panama and Belize, assisted with beachside sea turtle Research in Costa Rica, hiked all through the deserts and mountains of West Texas, and with that, I have become very in tune with the gear that I use. What I want to do with this serious is give some honest reviews on the gear that I have been using during my research. This can be anything from clothing to accessories to actual research tools (scales, calipers, sexing kits etc.). I truly feel that the gear that lasts during my time in the field is put to the ultimate test. My last pair of Keen Hiking Boots lasted me nearly 2 years, but ultimately had gashes in the sides, the sole was peeling off, and the lace straps had been glued together multiple times. To put it blunt, they were put through hell. They have had cactus stuck in nearly every side, crossed several rivers, climbed a few jungle mountains, been worn nearly every day, and yet they were the most comfortable hiking boots I have ever had. I’m not ashamed to say that I wore them around town for months after they were nearly unusable in the field. And its that kind of review I want to bring to you. Product reviews based on true field conditions. Keeping with the hiking boot trend, I am going to review the pair that I have had for nearly a year now. The Salomon Quest 4D 2 GTX Backpacking Boot (In Iguana Green of course). This post and future product review posts do use Amazon Affiliate links to link to products. I am currently only reviewing products that I have bought and used for a considerable length of time and have no direct affiliation with the companies. If a company is sending me a product, or paying me to review said product I will be extremely transparent about that fact and be as honest as I can about the quality of the product. Where have I used these boots? Herping trips in South and Central Texas. These conditions vary quite heavily in their use, but they have seen extremely high humidity, heavy use in wet conditions, climbing a mountain barely broken in for 7 hours, surveys conducted in hot and dry as well as rainy conditions and have been worn as a daily use shoe, when it is exceptionally cold or rainy outside. How have they held up? Surprisingly well actually. I bet that if I cleaned them up, you would be hard pressed to tell that they have been through some ugly conditions for the past 10 months. Below I’ve listed out my major pros and cons of this awesome pair of footwear. -Seriously. This pair of boots has held up extremely well in the given conditions. To date, I don’t think I’ve had anything break with these pairs. I don’t notice any of the rubber pieces coming off, or any major wear and tear. The boots use solid metal lace straps, that are much better than fabric ones of other brands. Additionally, the laces that come with the boots have held up to the wear and tear as well. -The boots feel solid on your foot and have protected me from some serious missteps. I’ve run down mountains and hills with no trails before without any issues. As a final testament to their toughness, I spent several months with a vicious, unstable cat outside my doorstep. This cat attacked me on several occasions and these boots saved my ankles on more than 1 occasion with barely a scratch on them! -I’m a big stickler for comfort in my hiking boots. I may need to wear these boots for miles in really difficult terrain. To me, they are a tool. I did not receive any blisters breaking them in, and have worn them (for short durations) without socks and had no discomfort or chafing. They hug my feet perfectly and give me a solid stable step. One of the few pairs of footwear I own, where I am not waiting to tear them off when I get home. -They really are as waterproof as they claim. I’ve stood in several inches of running water for several minutes and didn’t feel a drop get into the boots. This allows me alot of comfort and certainty while setting up mist nets, or running out right after heavy rains to survey for frogs. Mud and water are completely absent from my feet at the end of the day. The only issue is when they do get wet (covered below). -The price is an amazing deal! When I bought them, they were priced at around $225. Now you can order a pair from Amazon for under $130. That is a steal considering, I would still pay over $200 for these boots. There is a successor to this pair (the 4D 3 GTX) which are probably even better, but a hiking boot of this quality for under $150 is amazing no matter what. -This was something that I read several times before I bought these boots. Essentially, they say that the unique design helps push your foot forward making your hike easier in the long run. I do notice something different when I push off, and it might help, but to be honest I have no idea if that is a pseudo-scientific claim or something actually beneficial. Either way, it doesn’t seem to hurt. -As a tradeoff for all that comfort and durability, the boots are a little bit big. It’s not terrible and I don’t really notice this too much, but if you are wanting a lightweight pair for several day thru-hikes, you may want to find a pair more suited to your needs. I personally enjoy having a steadier more stable step, but there have been times (jumping across boulders for example) where I wish I did have a more agile pair of shoes. -One that has been recommended to me is this pair from Salomon. I haven’t tried them personally, but my experience with this brand has been extremely favorable. -This is by far my biggest complaint, but its one that comes with every pair of waterproofed boots I own. This pair works great and keeping water out… until its water higher than your ankles. Once this pair gets wet its taken days to dry out. I’m often working in humid climates, so when they get wet its a serious problem. Its not at all fun to be out in East Texas during a December camping trip with wet boots or having to constantly worry about getting them wet in the field. While waterproofing is extremely beneficial for most uses it’s really damaging when you are studying a semi-aquatic species like turtles or frogs. After having used this pair of boots for nearly a year in intense field conditions, I would absolutely recommend this pair to anyone looking for a new hiking boot. They are durable, waterproof, and extraordinarily comfortable. Unless you are planning an extremely lengthy hike or are planning on running into more than 5 inches of water, these boots would absolutely get the job done and then some. Follow this link to buy you a pair from Amazon right now. Have you ever been out at your local park and you see some turtles? Maybe they were basking on some logs, or possibly swimming around with their head poking out of the water. Have you ever wondered what its like to be one of those turtles? This is a White Lipped Mud Turtle (Kinosternon leucostomum) and might have noticed that big gray glob with a wire attached to the side of his shell. That’s what we call a Radio Transmitter. Now, ecologists have used these guys for years in order to track the movements and behavior of a variety of species of animals worldwide. Everything from deer and iguanas, down to even, seriously, kissing bugs. These devices work pretty simply. Essentially the device on the turtle is glued on and positioned in a way that reduces the impact it has on the turtles daily life. The transmitter operates for several months emitting a frequency that we can pick up with our radio receiver. In order to better pick up that signal, we use an antenna that boosts the signal and allows us to a position where the turtles are at through triangulation. After spending some time messing with the gain and volume we are able to locate about 10 turtles in a 3 hours period. Now, it may sound a bit easy. You just turn on the receiver, point the antennae and walk that direction. Simple right? First, we need to find the turtles to actually put these transmitters on. For weeks we set out every night trying to find turtles by digger through the leaves and dredging up and down the creek. On some occasions, we carried discarded fish heads to bait turtle traps. Do you know how nervewracking it is walking through the jungle at night with a dim headlight and a handful of fish heads knowing that the night before had some of the greatest big cat activity ever seen on the property? Yea. I jumped once or twice. But I prevailed. FOR SCIENCE!!!! Once we found 10 turtles of a suitable size we fixed the receivers and let them go where we found them. Then all we had to do was track them! Well… That was tricky at first. You see….. Turtles move. And when they move, we aren’t entirely sure where they go. You would think they go downstream because its easiest right? Wrong again budding scientist. Often, these turtles would move from our Swimming Hole ( A fantastic location for us to access) and go nearly a kilometer upstream to our other Swimming Hole. This required us to go along a windy up and down trail or make a river crossing. And here’s the kicker. We don’t know if they are at that location until we get pretty much there. Yes, our antennae lets us pick up signals from a couple of kilometers away, but thats with ideal conditions. This swimming hole is upstream a curvy rive, and most of the time the turtles hunker down under a boulder or in the leaf litter, obscuring the signal. And even if everything is working correctly, you may have been walking the wrong direction thanks to a little phenomenon known as bounce back. Those signals that the transmitter produces are not perfect. In fact, they often bounce off of rocks, hill faces, large trees etc. etc. There were one too many times that I walked straight into a vertical rock face because the signal was pointing me there. When in reality the signal was coming from directly behind me. AND! To top it all off. This river floods. And little floods that might make my feet wet. Im talking about Massive 45 cm in 30 minutes floods. Floods that carry entire trees downstream and destroy our bridges. Now how do you track turtles when its impossible to cross without drowning yourself? A Zipline ladies and Gentlemen. Thats right! We built a zip line specifically so we could track turtles during floods! In the video below I show you our system and what a true flood looks like. Now. I don’t want to give you the wrong idea. There are loads of obstacles that come with field biology. It is a mentally, physically, and emotionally draining task. The challenges you face are difficult to overcome. And that is exactly why I love doing it. Nothing gives me greater satisfaction than completing a hard days work in the field. When I get back, the coffee is stronger, the beer is colder, and the food is more nourishing. Then, when you start to analyze the data, write the paper, or come up with some amazing results you actually get to see what your hard work and dedication are going towards. That is why I will always love field biology. Do you want to get involved at T.R.E.E.S.? They are currently accepting interns for 2019, and there’s a good chance I’ll be there too! Follow this link for more information about their internships. Do you want help with your conservation, sustainability, or nature-focused endeavor? I offer Affordable Social Media and Brand Consulting for select accounts. Send me an email at dilljone96@gmail.com for inquiries. EDIT** If you read part of this already, please know that I accidentally edited away most of the post. Sorry! So this week I decided that I need to take this blog off of hiatus. If you are one of my (few) followers, you may have a noticed an extreme drop in the amount of content I posted. For that, I apologize. Between school, work, managing our startup, Brittany leaving for a job, volunteering at expos and finishing up my research project (whew!) I barely had any time left to dedicate to this blog, but I’m going to get back into it! Me holding our Peregrine at EarthX the other week. Also me and Brittany’s anniversy. Also Earth Day. Also the day she left for a job in Kentucky for 3 months. I want a way to connect with my readers and do more posts that reflect my inner thoughts. Not just me trying to emulate philosophical writers like Leopold and Muir. I spent some time reflecting on what I was producing and I realized something crucial. IT DOES NOT HAVE TO BE PERFECT. This blog is a reflection of me. While that means everything I produce is going to be top quality, I cant be stressing and worrying about every minute little thing. It took some time, but I realized that its okay if my word choice is not spot on. Its okay if I cant find the third point to make an Oxford Comma happen. It is okay that not every post I create and every word I write is not meticulously laid out to create a powerful narrative. I am me. I need to showcase that better. More sharing of things I loved this week. I consume a lot of media. Written blog posts, videos about key issues, or really cool images from NatGeo. Whatever it is I want to share it with you all. I realized that there are a ton of different platforms pushing different content out into the internet. I really want to showcase the platforms and the content that speaks to me. I’m actually starting right now with a list of things I loved this week below. I realized that I was essentially just dumping random thoughts and journal entries onto this blog. But honestly. Why should you care? There’s a ton of blogs out there that share day to day experiences, but I want to be more than that. I want to make a difference and give something back to my readers. Essentially I want to be a resource. Not just a diary. Below are a few topics and initiatives I plan on rolling out. Helpful guides about topics I know. Citizen Science, Herpetology, Conservation etc. More opportunities to get to know me. Did you know I have a startup board game company? Or that I handle birds of prey for education? Or that I have Goldendoodle named Dudley? I spent so much time cultivating the professional self of me that I failed to inject any personality or my actual life into my blog. That changes today. If you follow me on Instagram @contemporary_conservationist you know that I try to actively comment and engage, do livestreams, and am always available by direct message. I want to bring that same energy and openness to all my platforms. I’m still trying how to work that out on this blog, but I promise that changes are in the work. I have spread myself thin. While yes, that means I have a presence everywhere, the downside is that each of those platforms falls short. I let this blog go completely to focus on other things. I cant change the amount of time in a day I have, but I plan to be more active on multiple platforms, and less active on a single platform. With that, I am connecting all of my platforms together. My Instagram is going to have a feed on this blog. I’m working on developing a youtube channel for Q+A’s, any videography stuff I do, or just to create awesome videos about a topic I am passionate about. So what does that mean to you? That means that I will have more diverse content. Not just pictures, not just blogs, and not just videos. While pictures and written work will still make up the majority of what I do, I am going to be encompassing them into more content for you all. So with all that in mind I hope you follow this blog and comment below if you have any burning thoughts or comments on what I’ve written. With that in mind here are a few things that I stumbled upon this week that I simply adore! Hal Brindley over at travel4wildlife.com wrote this awesome piece on how photography and blogging promotes wildlife conservation. This is a topic I support fully. It is something I am trying to push, and if you want a more in-depth explanation of why it works, I would check his post out. This is a podcast I’ve followed for some time now. Its an awesome blog run by the New Zealand Department for Conservation that details what project they are currently working on. The one I’m linking to, Fiordland Kiwi Diaries, is an amazing series that I love to read whenever it hits my inbox. I was doing a bunch of driving earlier last week so I had the time to catch up on a few podcasts. One of my favorites is Freakonomics. I won’t go into the details of the show, because it is such a powerhouse podcast that I feel everyone at least knows about it. The episode that I got to listen to was an amazing piece on if animals, and in this case monkeys, will follow the same economic patterns of humans when a form of currency is introduced. An amazingly insightful podcast that I really enjoyed listening to. The folks over at Pop Chart Lab made this awesome poster that shows all. ALL. of the birds of North America on 1 poster. If you’re a birder, a naturalist, or someone who likes hanging avian posters in your hallway this poster is an amazing piece. Krista Stevens, another WordPress blogger, shared this post recently. While very short it shows a pointillism piece of an Elephant from the artist Q. Rumbley. I love it! This is a gallery of Tokyo in all its glory. Celia Knox is a teacher and blogger who now lives in Tokyo. The pictures that she has been taking are beautiful and amazing snapshots of life in Tokyo. Whether it’s the Cherry Blossoms or the local artwork its an amazing gallery nonetheless. Hope you enjoyed! Follow this blog for more content, and sign up on my email list to get the latest posts delivered straight to your inbox. This year I had the pleasure to lead the Herpetology Team for Lick Creek Parks 2018 BioBlitz led by the TAMU Society for Conservation Biology. We herped through the night and found a ton of awesome reptiles and amphibians. Heres a little minute and a half video of the animals and all the awesome volunteers helping us out! Below are some extra pictures and content that didnt make it into the video. This is one of the prettiest box turtles ive ever encountered! 1 of 4 Dekays Snakes (Storeria dekayi) we found! Pretty little T. proximus found on the trail. Almost stepped on em!